Along with everyone else, I grew up with some fruitcakes, and not just the ones on my family tree. These were the bland, dry, store-bought items perhaps picked out in a mad rush in the checkout aisle at Walgreen's. "Oh gosh! We forgot something for Thomas's family. What will we get? 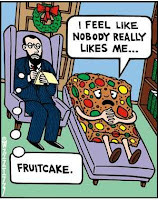 Oh, here's a lovely fruitcake - that'll do!" Yeah, right. Being of good Irish and German stock, our homemade fruitcakes were somewhat different. The Irish version was more an Italian pannetone style with yeast, dried raisins and currants. Plus lots of Irish whiskey. The cakes would be baked, cooled, then places in a tin and infused with some whiskey. I've made variations of fruitcake through the years - one year I even made a Hawaiian version with macadamia nuts, candied pineapple, candied cherries and coconut - that one was great! Especially since it was soaked in a little bit (okay, not so little) of Malibu rum. But my favorite hands-down version is traditional German stollen. I've had it from the Swedish Bakery here in my Chicago neighborhood and I will need to swing by and see if they are carrying it this year. But homemade is the best with this recipe below - it is from an old Sunset magazine article - and relies upon cottage cheese and baking powder, not yeast, for its rise. Combine flour, baking powder, sugar, salt, spices, almonds. Cut in butter until resembles coarse crumbs. Blend cottage cheese, egg, vanilla, almond extract, rum, currants, raisins, lemon peel; stir into flour mixture until all ingredients are moistened. Mold dough into ball, place on floured board, and knead 6--10 minutes or until smooth. Roll out on floured surface to oval 8 1/2 by 10 inches. Lightly crease dough just off center, parallel to the 10" side. Brush dough with 1 T of melted butter. Fold smaller section over larger. Place on ungreased sheet which is covered in brown paper (probably parchment these days). Bake at 350 degrees for 45 minutes or until crust is well browned and bread tests done in center. Brush with remaining butter, sprinkle with remaining sugar. Given that my husband loves fruitcake, you would think I'd have made at least one in the years since his mom died, but nope. Maybe I'll give it a try next year.